There are not too many famous jewelry pieces in the world, but this one is very noteworthy. Called the Mughal Spinel Necklace, it's beautiful in every way and there is nothing else quite like it. It is estimated to be worth between $1,600,000 and $2,500,000. It has 1,131.59 carats in it and it offers eleven differently shaped spinels which are purple in color. It was remounted and reset at some point in the 19th century, estimated, into the current setting. The spinels in the Imperial Mughal Spinel necklace are the stones that go around the front of the necklace and while each one has its own unique design, the type of stone is the same. Many of the spinels are engraved with the names of people from that time period such as Carew Spinel, Aurangzeb, and Emperor Jahangir, to name a few. These are some of the names of the royalty tht owned this piece 400 years or more ago. This necklace has an extensive history that is very interesting to read and yet astounding that it has remained intact over the years. The spinels got their name due to the similarity of the stone to rubies, but when you look at the chemistry behind them they're two different types of stones. 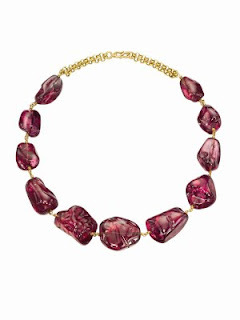 Spinels are a stunning stone and in this famous historic necklace they are seemingly priceless. Spinels are found in the frontier between Tajikistan and Afghanistan in a region known as Pamir. They could only be found in the Badakhshan mine at the time this necklace was created. Fine jewelry has been around for thousands of years but it is rare to see a piece that's as extravagnat as the Imperial Mughal Spinel Necklace. With its extensive history behind it, it is not hard to understand why it's a piece that's near priceless.